Your glass is always half full with an MB Positive water bottle. With a colorful top and crystal clear plastic bottom, your smoothies and fruit-infused waters will look doubly delicious. Pop it into your handbag, gym bag or book bag and you’re ready to go! One thing that bothers me is that its really hard to wash it. It also gets this bad smell if you leave a drink (lets say tomato juice because that's what happened with my bottle). I really love this bottle though, fits in a lot of spaces and is made of good material. it's just an ordinary plastic bottle, the price could be lower. The good point is that is is small, so you can carry it in basically any handbag. I really wanted to like this bottle –– once I'd seen it on the site, I kept coming back to it. It hit everything I was looking for in a bottle, specifically that it was BPA-free and food safe. I wound up purchasing the Litchi color. 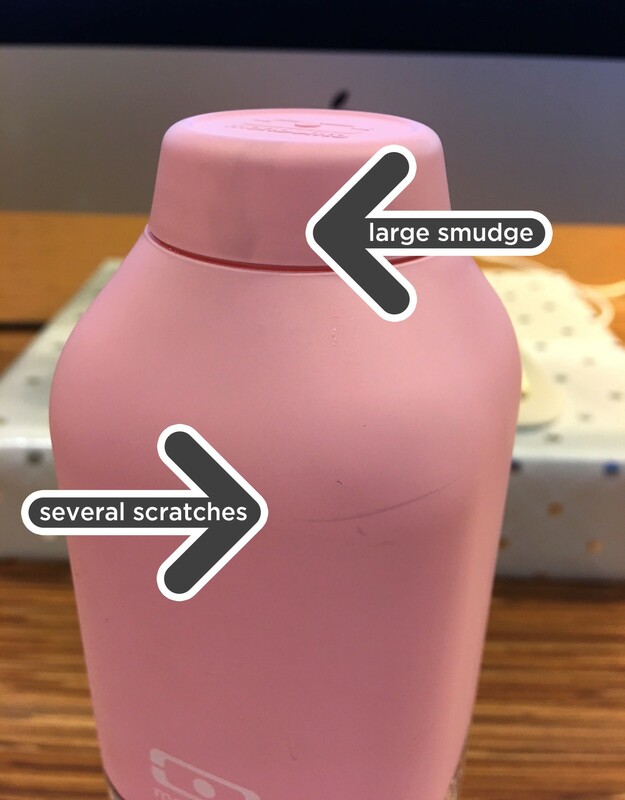 My first and more minor gripe may be a personal one, but I thought it might be helpful for anyone considering their purchase: I purposely wanted this compact bottle for transporting my homemade smoothies/drinks to and from my office. 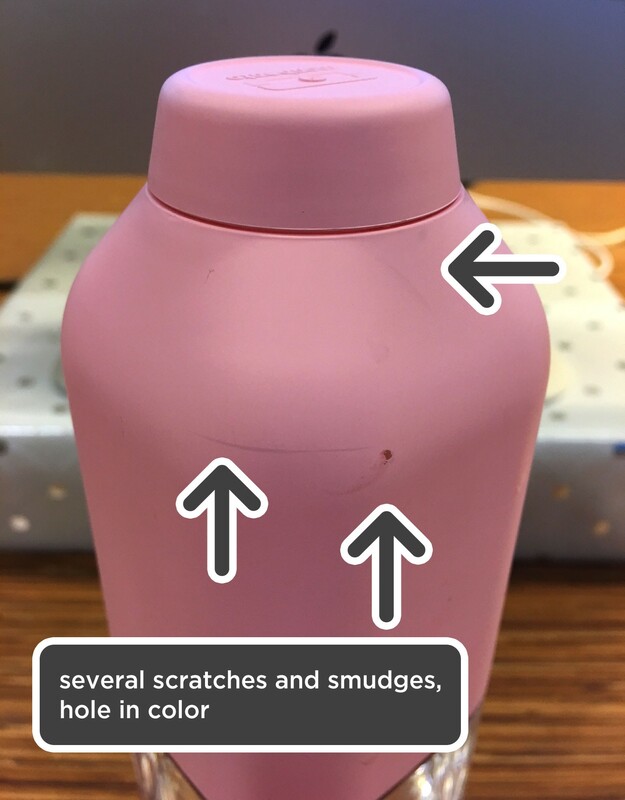 With the compactness of the overall bottle, however, comes a fairly small opening for the bottle, making it really hard for my blender to pour directly into the bottle without making a mess. This isn't really the bottle's fault, just something I wanted to inform readers of. The reason for my low rating is that I've only used this bottle three times since receiving it and the top, colored portion is already visibly scratched. I bought this bottle over others because of how it looked –– I loved the color choices and purposely sought out something aesthetically pleasing. I expected it to stay attractive, at least for the first few days of use. I made sure to be careful with it; all I've done is tuck it into my work bag, keep it on my desk, and hand wash it at home, and somehow the colored plastic is already chipping, exposing the clear plastic beneath. There are also a bunch of grey scratches/smudges that have appeared in the material. At first I thought it was just dirty, so I tried cleaning it again, but they're permanently there. I suppose $18.99 isn't a crazy amount to pay for a bottle, but at that price and with all the accolades it claims to have, I had expected far better durability. I'm incredibly disappointed and just wanted to inform other buyers, in case you're stuck between this bottle and another one like I was!